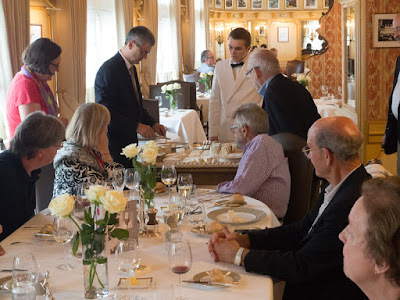 Our Lyon visit culminated in lunch at L’Auberge du Pont de Collonges, Paul Bocuse’s iconic restaurant in Collonges­ au­ Mont­ d’Or. This restaurant is a holy grail of classical cooking. Since 1965, it defends its 3 Michelin stars. 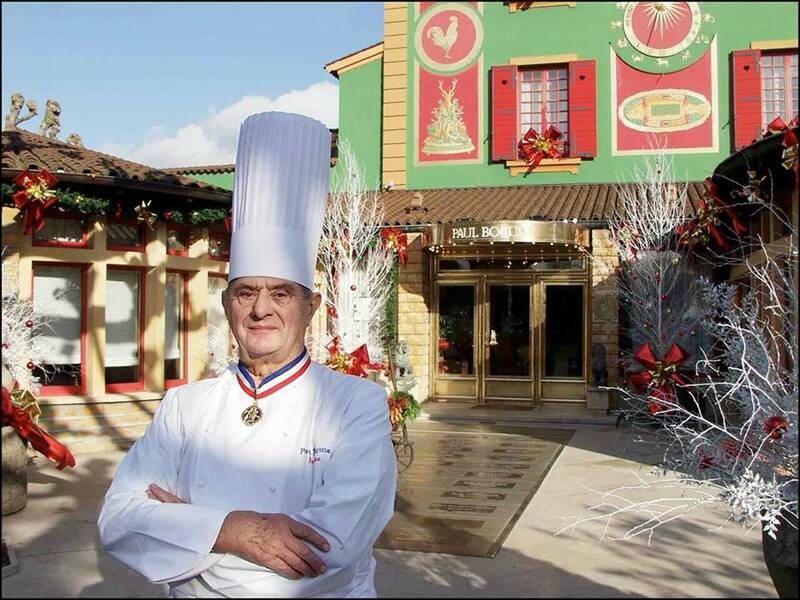 Paul Bocuse was a chef who pushed boundaries and is still a benchmark for technical perfection in the kitchen. 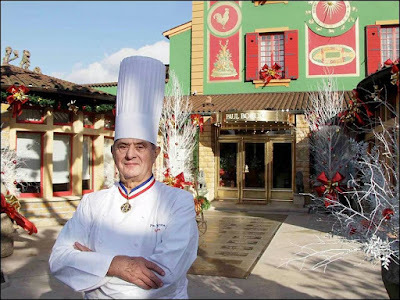 Paul Bocuse turned 90 earlier this year and is no longer standing in the kitchen himself. Until recently, he used to come to the restaurant to greet his guests, but he no longer does this. We were greeted by Madame Bocuse. 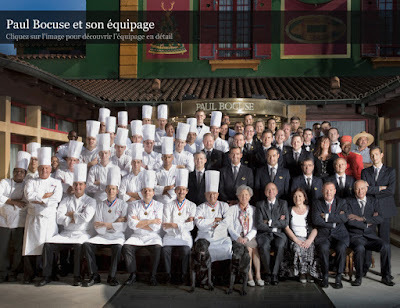 Although Paul Bocuse was not there in person he was clearly there in spirit. Nothing has changed since the days when he stood behind the stove. All the classics of Paul Bocuse are on the menu. We had as fish course the famous Loup en croûte feuilletée sauce Choron; it was cooked and presented probably the same way as it has been for the past 30, 40, 50 years. The only thing that was different from 30, 40, 50 years ago was that Paul was not cooking in the kitchen. We were guided into the building by Daniel and Said, who both have been working for Paul Bocuse several decades. Paul Bocuse no longer is in the kitchen. Christophe Muller is the Executive Chef (including the other restaurants of Paul Bocuse) and Gilles Reinhardt is the Chef de Cuisine. Christophe Muller (from Alsace) took over as Executive Chef in September 2011 (from Christian Bouvarel) after over 20 years in Paul Bocuse's kitchen. Gilles Reinhardt, after haveing worked in the kitchen of Paul Bocuse before, was rehired as Sous-Chef in 2000. During the dinner I had a chance to sneak into the kitchen. 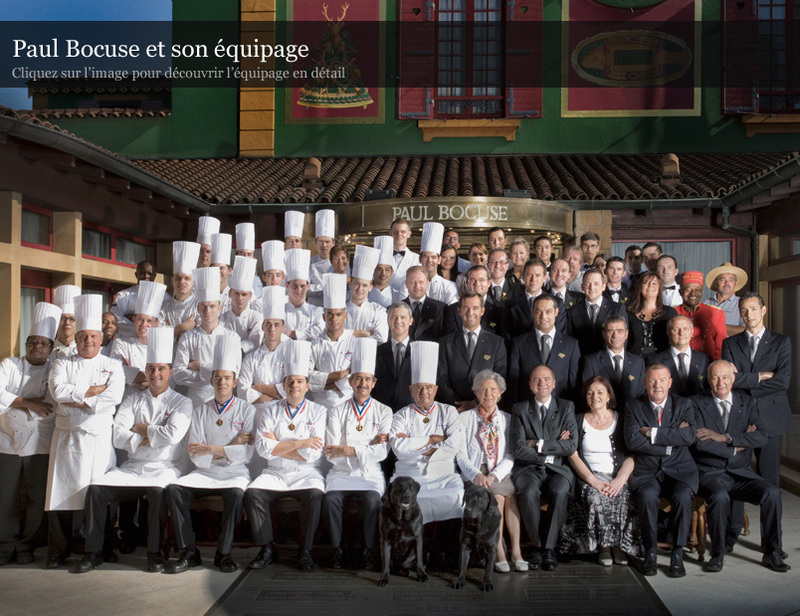 Until not too long ago, Paul Bocuse would welcome his guests. Now, it is done by his wife Raymonde, who also turned 90 earlier this year. You can eat a la carte or choose between 3 menus: Le menu Classique (Euro 165), Le menu Bourgeois (Euro 225)and Le menu Grande Tradition (Euro 265. Annette had ordered for us the MENU CLASSIQUE and chosen the courses. A la carte, our first course was Euro 55, the fish course Euro 75, the cheese course Euro 35 and the dessert also Euro 35. What a memorable meal! 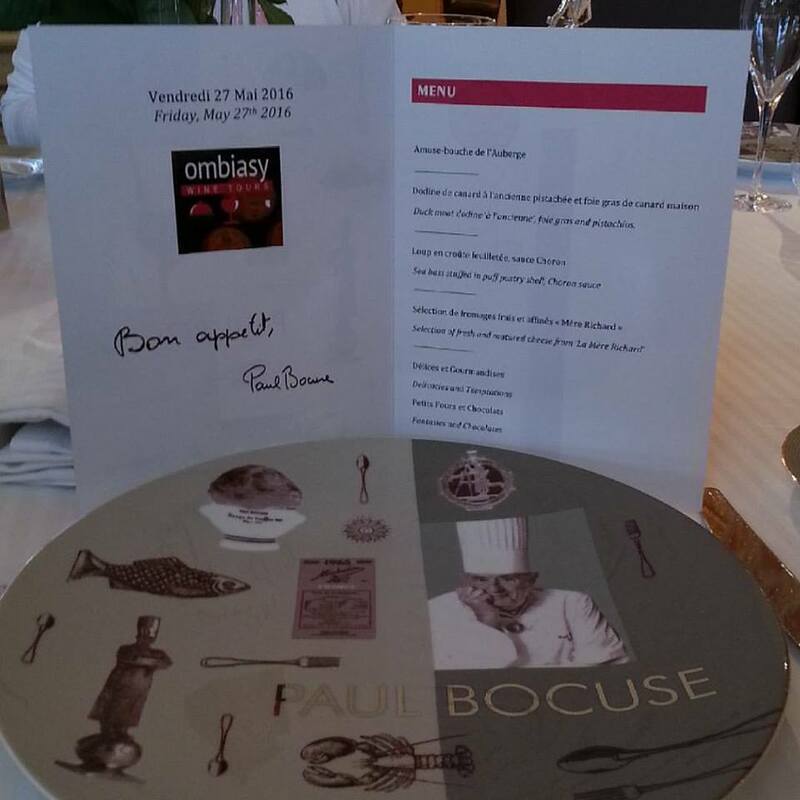 Thanks very much Paul Bocuse. Wonderful and charming review and delightful photos! Lovely that Madame Bocuse was there to great your party!